This booking script allows you to change the calendar size, colors, fonts, borders, date & time format, week starting days, etc. There are also other options to customize your booking calendar further: define turn-over days (half days bookings); allow/disallow payments/bookings; set currency and deposit payment; send email confirmations, SMS notifications, customize the booking form and more. Translate your online booking calendar by using the built-in Language Module and add your own system messages, front-end and back-end titles. A price management module is available with the booking calendar script. You can add seasonal and group prices. The Availability Booking Calendar script is very easy to install - an installation wizard will set up the database for you. Once you have installed Availability Booking Calendar all you have to do is to copy and paste a few lines of plain HTML code into the web page and the booking engine will appear on page. This php booking calendar script has an easy-to-use and password secure online control panel which lets you manage bookings and clients easily without any programming knowledge. For experienced web developers and web designers we have the Developer Package which includes the PHP SOURCE Code and allows you to make your own changes. Free installation support is included! Release Notes: Availability Booking Calendar 4.0 includes several new and enhanced features, including new front-end and back-end interface, SMS notifications, multi-language support, invoicing module and a lot more. 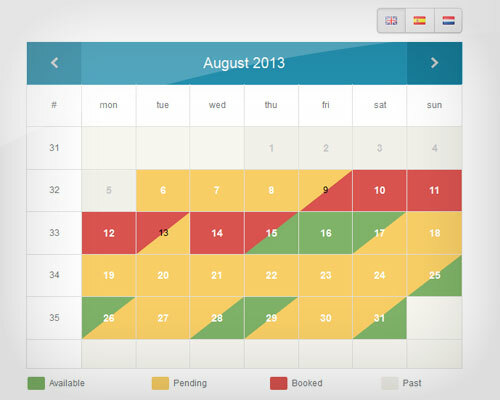 You can be the first to write a review of Availability Booking Calendar!